(Dorchester, MA) In a world where the future of the arts is unclear, and many would like to be transported from reality for a while, it is refreshing to see the next generation of artists from Boston Arts Academy not only take pride in their art, but convey a powerful message of pride in one’s roots. 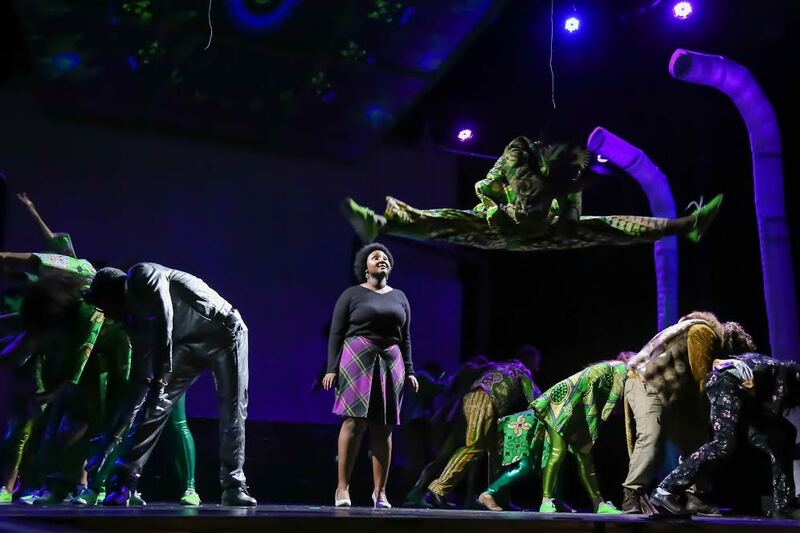 In BAA’s production of The Wiz, I was blown away at the maturity and emotional depth that a group of young adults still in high school not only understood, but also was able to convey to the audience. In BAA’s The Wiz, a young and hopeful Dorothy (Kamiya Parkin) can’t wait to begin her college career and escape from Roxbury, Massachusetts, the town she grew up in. But during a magical natural disaster, she is swept away to Oz and, upon landing, realizes she has killed Evamean, an evil witch. Under the guidance of Addaperle (Alexis Maxwell), a good witch, Dorothy travels to the Emerald City to speak with The Wiz (Danny Rivera) in hopes of returning home. Along the way, she makes friends with a Scarecrow (Malik Mitchell), a Tin Man (Justin Dimanche), and a Lion (Ricky Pate), who also desire gifts they believe only The Wiz can grant. But when instructed to murder the Wicked Witch of the West Evillene (Jade Mitchell), the group fears they may be in over their heads. The Wiz itself is a fantastic show. Drawing from African-American culture and music to tell the traditionally white-saturated story of Oz, the musical boasts soulful songs such as Aunt Em’s (Anjelica Bethea) heart shaking “The Feeling We Once Had,” and Glinda’s (Sydnie Cooper) uplifting “Believe in Yourself,” while jazzy number “Ease on Down the Road” and the grittier “No Bad News” dig deep to find a perfect marriage of jazz and showtunes. One of the most prominent aspects of the cast was how charismatic they were, which fueled the likeability of the characters they were portraying. Not only was the acting professional and clear in its intentions, the students’ passion was apparent, which made a world that I’ve travelled to many times in my own short life feel fresh. This was true of all players across the board (or stage, as it were), and it was rewarding to see so much energy pouring out of each performer. They weren’t just telling the story of Dorothy in Oz, they were telling their own story about what it means to travel the world and still ache for a place called home. William McLaughlin’s choreography was lovely—soft but able to become aggressive when necessary—though it did become repetitive. Similar motions were used in dance numbers throughout the show, but the performers were well synced and mirrored each other beautifully. The arched, cylindrical spires lighting up the edges of the stage, courtesy of Jenna McFarland Lord’s scenic design, helped transition scenes from the Yellow Brick Road to the Emerald City with ease. I can only imagine the scenes she could have detailed with a larger budget. And Elisabetta Polito’s costume design for the four leads echoed the show’s theme of the importance of roots by both drawing from the original, classic looks while adding a modern twist to keep things relevant. BAA’s The Wiz is a wonderful celebration of home and being proud of where you come from. And while drama club tends to be an extracurricular in most schools, the students of Boston Arts Academy are clearly in it for the long haul. The collaborative, student-run production proves there is nothing quite as compelling and unifying as the arts, and there truly is no place like home. This entry was posted in Uncategorized and tagged 2017, Charlies Smalls, Dorchester, January, L. Frank Baum, MA, Maura Tighe, The Strand Theatre, The Wiz, The Wonderful Wizard of Oz, Travis Manni, Tyrone Sutton, William F. Brown, William McLaughlin by Travis Manni. Bookmark the permalink.